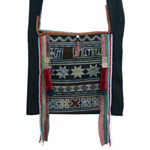 Working from their villages in northern Thailand, the Akha artisans craft this shoulder bag in the traditional cross-stitch embroidered Pamee pattern. In Pamee, geometric designs dominate. There can be found spades, mazes, screens, squares within squares, triangles, quadrilaterals etc. 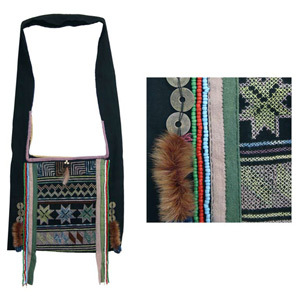 Depending on their mood, memories, imagination and their own taste, the women varies these traditional geometric designs, often mixing them with borrowings from other ethnic groups’ patterns, making the bag you will receive truly unique. 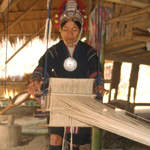 This particular piece, named Pamee Faith, is hand-woven with cotton, colored from natural dyes and entirely decorated by hand.